With Halloween round the corner, you must be ready to create “scary” crafts. From crafty pumpkins, flying bats, backyard cemetery to hanging ghosts, there are so many things you can give your home a complete Halloween makeover. 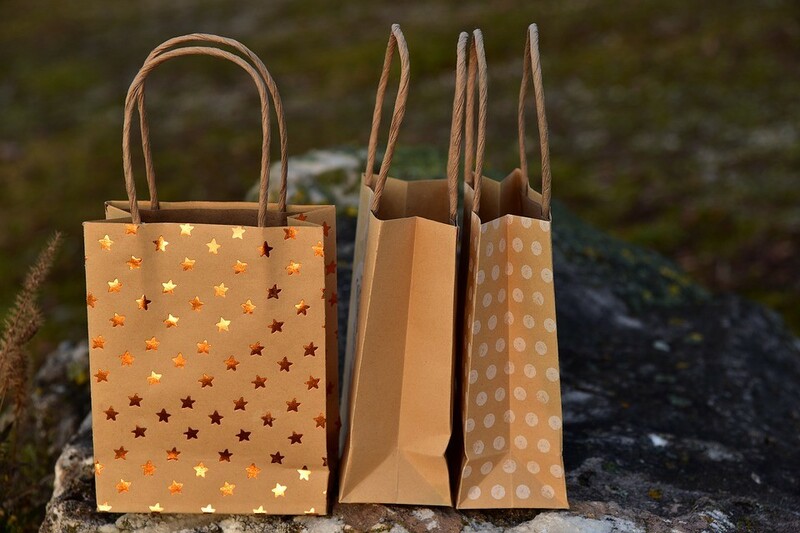 Instead of spending money on expensive crafts, make them at home using used items around you. This way, you not only save money, but also recycle the waste which otherwise will go to the landfills or ocean. If you think that you don’t possess good craft skills to make your own decoration, don’t be disappointed. Here are projects for the people with any skill level. All you need to collect the old stuff like bottles and packaging. This is one of the easiest Halloween arts from the used things. All you need a transparent plastic bottle (without any color) and muslin cloth and a piece of iron wire. Remove the label from the bottle. Noose a piece of wire around the neck so that you can create the arms of a ghost. Now cover it up with a muslin cloth. And draw the eyes of the ghost over the cloth with a black marker. Your ghost is ready to scare. Place it in a dark lit spot. The effect would be superb if you could create couple of ghosts in similar manner. 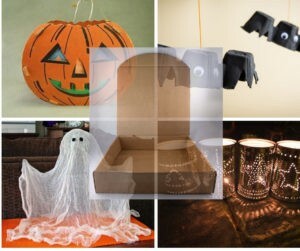 Another great Halloween decoration idea is from the cardboard or corrugated boxes at your home. Fold the box and you will get two sides at one end. Cut them in U shape. Use tape to join the sides. Wrap them with a glace paper (grey colored). Make more cardboard tombstone using the same technique and place them in your courtyard. Creating Halloween bats from egg carton is easy. Make sure to have paper type egg carton, black paint with paintbrush, glue, white paper and wiggly eyes. Also cut the bat wings out on the front of egg cartons. Cut a line of three egg carton cups. Paint them black from inside and outside. Let them dry. Afterwards, add the wiggly eyes to the middle cup of the carton. Make a hole in the top of the bats to place a thread or string through to hang them. Without lanterns, Halloween decoration seems incomplete. Good thing is that you can create them using old tin can. Let’s see how to create them. Take clean empty tin cans of coffee, processed foods or spices. Any size will work. Fill them with water and keep in the freezer. Take them out when the water is frozen. Use marker to draw the image or word onto the can. Use the hammer and nail to puncture the design on the can. Once you are done, place the can in hot water to melt the ice. Pain the tin can using spray or acrylic pain. Once the pain is dry, use toothpick to poke some of the holes through as pain can clog them up. Place a candle inside the can. 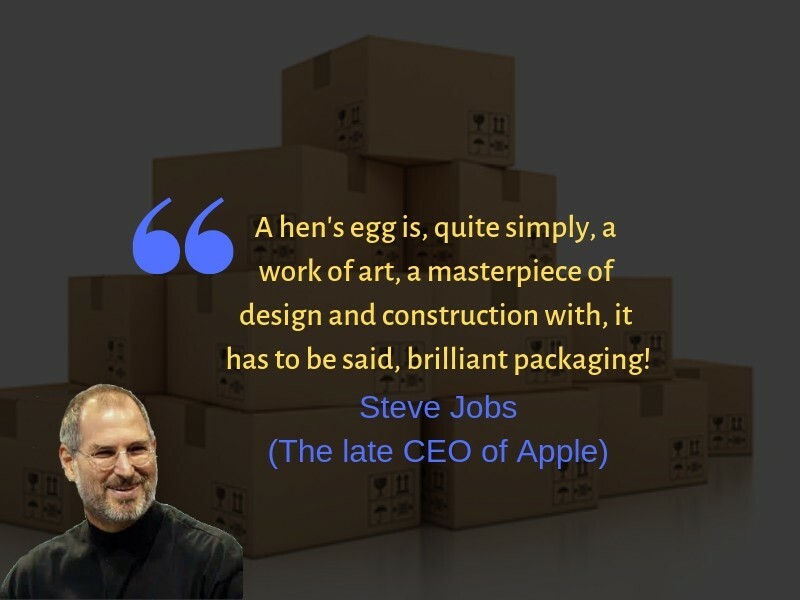 Do you have a plethora of cardboard boxes lying around? This is a great opportunity to make Halloween pumpkin out of them. Find a large cardboard packaging box. Unfold it in a way so that it lays flat on the table. Draw a shape of pumpkin with a stem on the top. Cut around the outline using a knife. Pain it in orange. Let it dry. Carve out a pattern to make teeth and eyes. So these are some DIY ideas to create Halloween decorations from old and used stuff. Do you have such interesting ideas to share? Please share with us by commenting below.